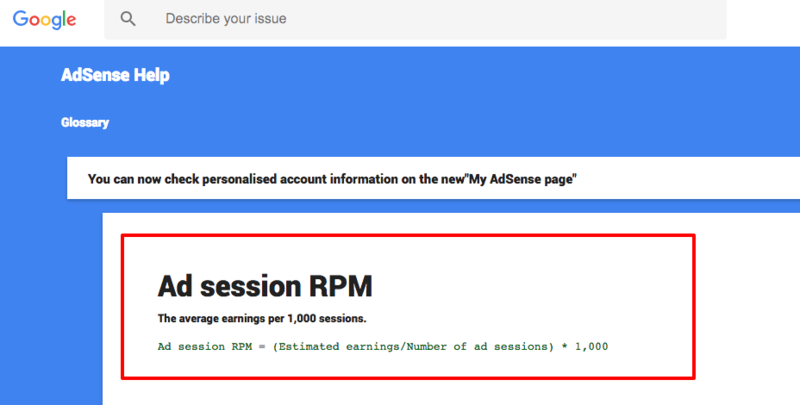 What Is Ad Session RPM In AdSense? It's Important. 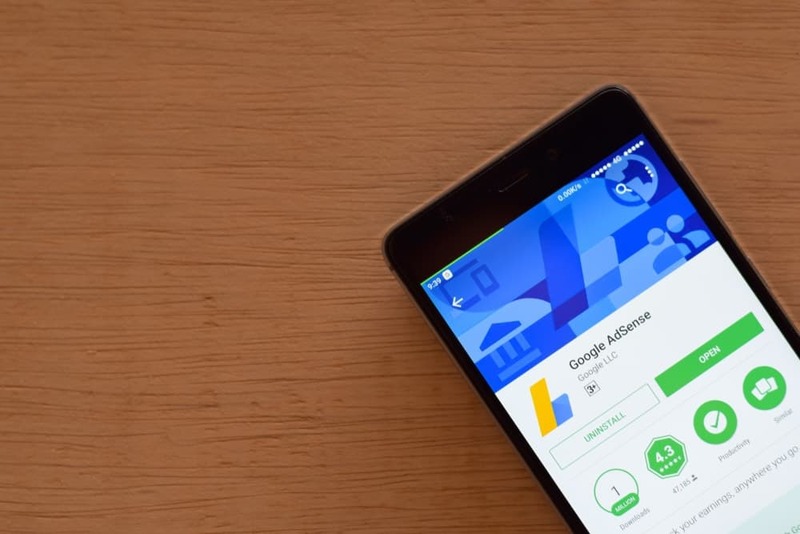 What Is Ad Session RPM In AdSense? It’s Important. Ad session RPM is also referred to as EPMV (earnings per thousand visitors) or total session revenue. It is a metric used to demonstrate the total ad earnings generated by 1,000 visitor sessions on a publisher’s website. The term ad session RPM is how Google products, like AdSense, are choosing to define this metric that looks at total revenue per session. It is the best metric for digital publishers to use when determining how much they are actually earning per visitor (the ultimate ad revenue metric). Publishers have often focused on increasing CPMs and RPMs; however, basic math tells us that we are missing a big part of the equation if the hope is that increasing these metrics will increase overall revenue. Higher CPMs and higher RPMs do not necessarily equal more revenue! But, higher ad session RPM will always point you in the right direction. Let me explain this a little more in-depth. CPMs (cost per 1,000 impressions) have long been used by advertisers to define the cost of an ad placement on a publisher’s website. They are a single variable in the overall ad earnings equation. Optimizing just CPMs is a very dangerous thing to do; as you can often do more harm than good. First off, ad networks will often manipulate publishers using CPMs (that link will show you all the ways they do it). Second, having high earning CPMs isn’t very important if the ads that display in those high earning locations cause users to visit fewer pages, or bounce more often. Because pageviews per session and bounce rate have a much larger effect on total session revenue than those high CPMs. 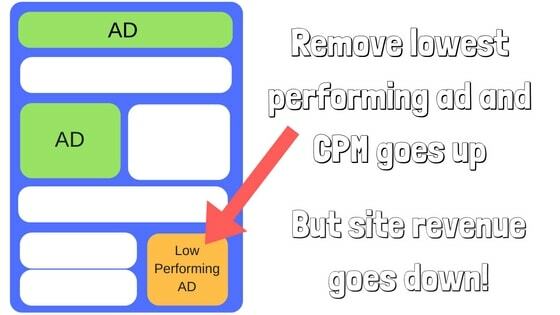 High CPMs may contribute to a high page RPM (total of all CPMs on a single page), but if the visitor bounces after visiting that page — instead of visiting 2 more pages — you’ve now lost 2 pageviews worth of ad impressions (and 66% of your potential session revenue)! Optimizing for high CPMs often trades short-term revenue for a bad user experience and less overall revenue per visitor. Not to mention, we’ve shown in studies that CPM optimization can actually lead to lower ad rates over time. Why is ad session RPM better? First, let me explain exactly what ad session RPM actually is. This video explains how ad session revenue actually works (more commonly referred to as EPMV when discussing total revenue per session). Ad session RPM = the average earnings per 1,000 sessions. 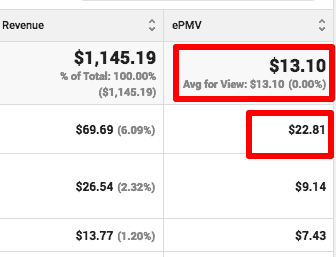 EPMV or ad session revenue is the paramount metric for publishers to measure; as it is the only one that can tell you if you are actually making more or less money PER VISITOR. Your CPMs can go up, but total revenue per visitor can go down. Your RPMs can go up, but total revenue per visitor can go down. If your ad session RPMs go up, your total revenue per visitor will always go up. Ad session RPMs total all the CPMs from all the pageviews on a single visitor session. This allows publishers to account for how the revenue generated from ads is balanced with the impact of the ad on the visitor’s experience. How does ad session RPM account for user experience? 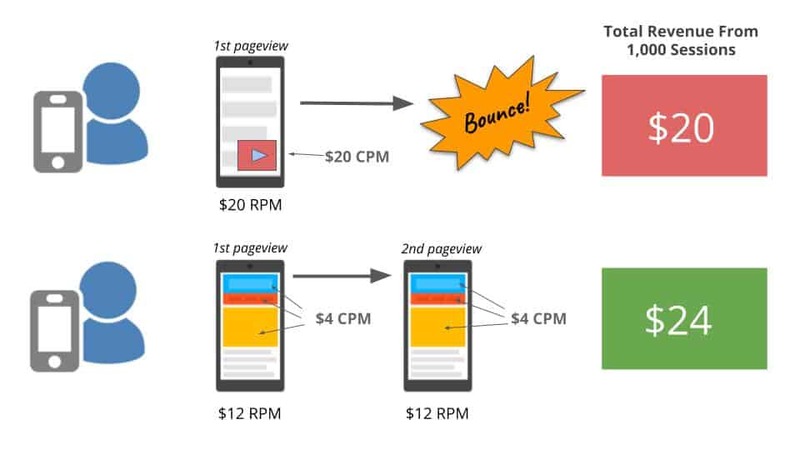 The defining factor in why ad session RPM — aka EPMV — is so much more important to publishers than CPMs or RPMs is because it allows publishers to objectively account for how visitor behavior is calculating into total website revenue. A mobile visitor lands on a site’s page that has a high-paying auto-play video ad on it. It is the only ad on the page and the CPM of that ad is $20 — accumulating a total page RPM of $20 as well! That visitor is annoyed by that ad and then leaves. The total revenue generated a for a thousand sessions like that will be $20. That same mobile visitor comes to the same site, but this time there are 3 display ads; each with $4 CPMs. The total page RPM is much lower now. It is only $12. However, this time the visitor is less annoyed and goes on to visit another page. 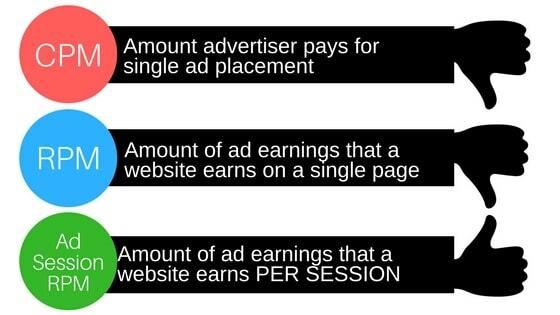 Assuming that the second page has the same ad setup (3 display ads, with a total RPM of $12), the total revenue generated for a thousand sessions like that will be $24. Thus, the higher CPM/RPM ad treatment produced a $20 ad session RPM. And, the lower CPM/RPM ad treatment produced a $24 ad session RPM. A website owner optimizing around ad session RPM will ultimately earn 20% more revenue over time than the publisher that would be optimizing with CPMs. This chart says it all. 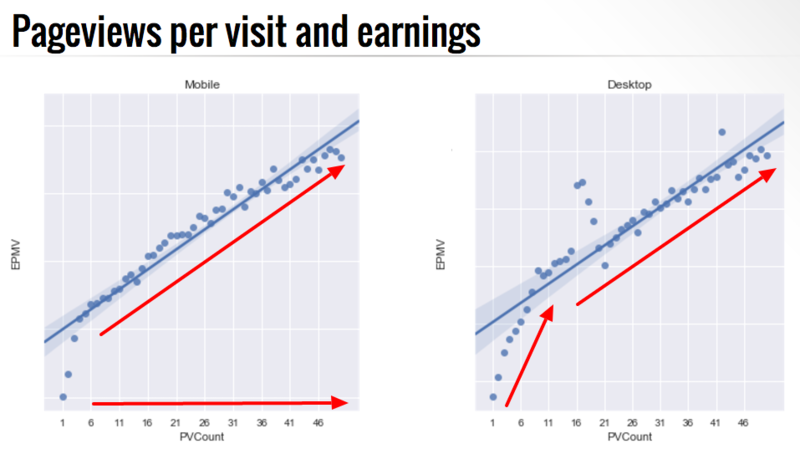 The science shows that there is a direct correlation between visitor engagement and total session earnings. You have to balance UX with ad earnings at all times. How do I make more money with this metric? 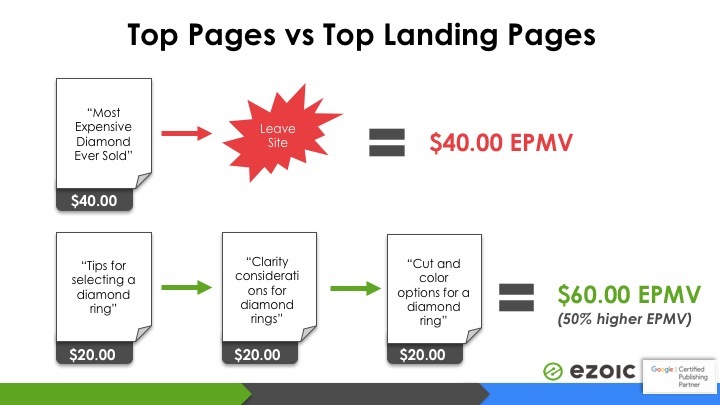 The best trick for earning more revenue using this metric is to understand which landing pages are generating your greatest ad session RPMs (EPMV). Here, you can see where I’ve highlighted landing pages that are about 80% higher than my site average. This publisher should probably figure out why visitors landing on these pages are generating far higher ad session revenue. In Ezoic’s free Big Data Analytics, you can see that EPMV has already been calculated for me, so now I can actually sort by landing page. I can see which pages that visitors land on end up generating the highest ad session RPMs. Essentially, page RPMs won’t tell me which sessions actually earn me the most money; however, seeing which pages visitors land on that generate the most revenue from all the pages they visit from that session ultimately will. Looking at top landing pages by ad session RPM vs page RPM will ultimately tell you which sessions are really earning you the most money. Here, you see that the RPM is higher on the page on the top, but because the visitors that land on the bottom page visit 2 more pages on average, the total EPMV is 50% higher. How do I use this info? Easy, find your top earning landing pages and find out what they have in common. You can see here that I have two landing pages with nearly equal pageviews. One is above the average site EPMV and the other below. The landing page with the higher EPMV is generating almost 130% more revenue. They may have similar article length (we showed why this is important here) or content topics. Discover what is making those pieces of content successful and build new content around these attributes. Or, modify existing content to take on some of the elements of those pages that may be contributing to their superior ad session RPMs. You really need to look at the data to get this info; as guessing this stuff just doesn’t work. This is the right metric to optimize around if you’re a digital publisher. Questions about the math, how these things are calculated, or how to best take advantage of this kind of calculation? I respond quickly and am usually able to keep the comments section on this blog filled with some pretty helpful info, so as it builds up, it is worth reading. It’s different for every website and every visitor that comes to your site. That’s the idea behind using Ezoic. Let machines learn for you and make small adjustments to every session to extend session length. If not using Ezoic, test and proxy traffic based on how they respond to different positions.